I found another DANBY, Model DAR125SDD that should make a good conversion - the dimensions are right and it does not have an internal freezer. This model is available from BestBuy, Wal-Mart or The Home Depot. As far as we know the only reasonably priced candidate for this conversion is the DANBY Model DAR440W. This is the white version of the DANBY Model DAR44BL that Wal-Mart is currently out of on-line. But they also have the Midea 4.9 cu ft beer keg refrigerator for $399.00, not a bad price for a ready to use kegerator. Sanyo mini-fridges have become almost impossible to find but not all is lost. Wal-Mart on-line, SAMS Club, Amazon and others sells a DANBY Model DAR44BL for less than $200 and this fridge makes a great conversion. I have another set of instructions on the web site for converting a Danby fridge but the instructions listed below fit the Danby as well as the Sanyo. Wal-Mart sells a Sanyo 5 cu ft refrigerator without freezer on-line for $249 (2/12/11) and they offer free delivery to the Wal-Mart closest to you. They will also deliver to your house for a small fee. Read the reviews on the Wal-Mart site - quite a few people have already converted these into kegerators. You can find these refrigerators here. Most customers buy this fridge from Best Buy. I found out recently that Best Buy has replaced the Sanyo fridge with Oster model OR5005M3M. I stopped by Best Buy and measured one and they are slightly taller inside. The Oster fridge should make a great kegerator, I'll convert one soon and will post the instructions to this site as soon as possible. Beer dispensers have been made from just about all types of refrigerators and freezers over the years. And most beer kegerator conversions still look like a refrigerator with a faucet stuck through the side once the conversion is done. 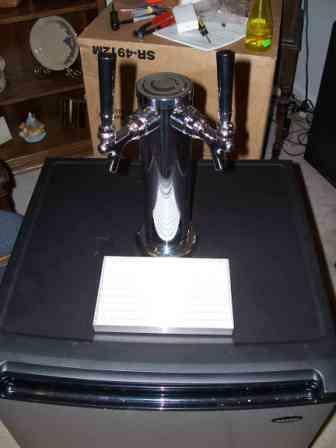 A mini kegerator made from a mini refrigerator, particularly one with a beer tower style kegerator tap mounted on top, actually looks like a kegerator. 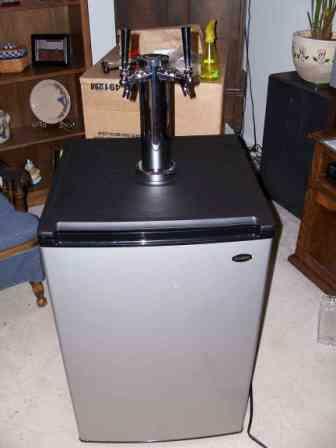 A beer kegerator made from a mini fridge should give you many years of trouble free service. This is a step by step guide to build a kegerator for homebrew beer or soda. 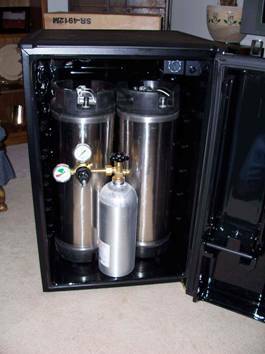 A keg cooler or mini kegerator is a great home project that can be completed in less than one day. 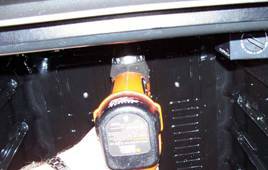 These instructions will help you build a home beer dispenser or beer cooler for homebrew beer from a Sanyo mini fridge. A Sanyo mini fridge makes a great mini kegerator because of it's compact size. This kegerator refrigerator would look great at the end of a counter, inside a bar or on a counter top. The same conversion can be done with two kegerator taps mounted through the door if you would rather put your beer dispenser on a counter top. 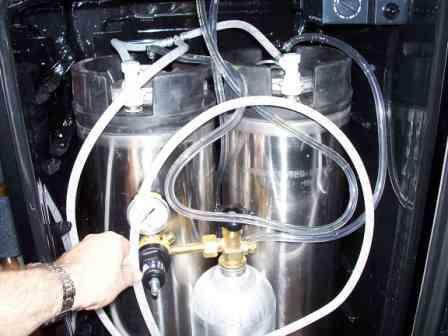 Although these instructions were written for homebrew beer kegerator and Cornelius kegs, the exact same conversion will work for two tall, slender 1/6 draft beer kegs. 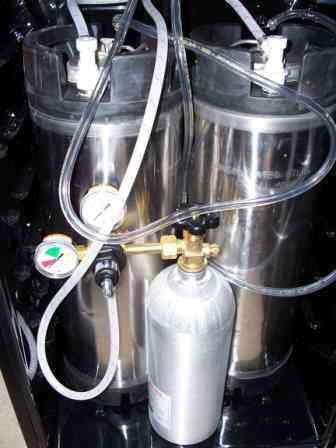 The only difference between the two conversions is that a kegerator conversion for draft kegs will use keg couplers instead of the soda type disconnects shown in the pictures. The fridge needs to be at least 4.4 cu ft. The fridge can not have an internal freezer compartment. The inside needs to be at least 25.5" high. The inside needs to be at least 16.5" wide. Slightly narrower will work, but the kegs will be staggered and the CO2 tank may not fit inside. Or a 2.5" - 3" hole saw. 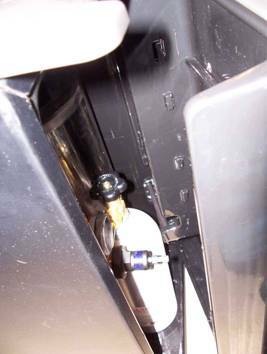 These instructions will guide you through converting a Sanyo refrigerator into a completely self contained kegerator for homebrew beer. As you see from the picture, two Cornelius kegs and a 5 pound CO2 tank will fit inside the Sanyo refrigerator. You’ll notice from this picture that the door won’t close because some features are in the way. 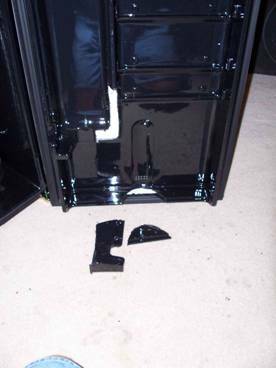 Many who convert a Sanyo refrigerator will remove the inside door panel. But the solution is much simpler – you only cut away the parts of the door that are in the way. You will need to cut away part of the can holder and part of the ridge that runs across the bottom of the door. 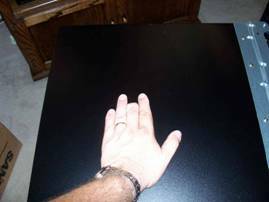 The cutouts do not need to be exact & can be larger than needed with no harm to the kegerator. This picture shows the cut-outs and the pieces I removed from the door. The white areas in the door are the door insulation showing through the cut out areas. The insulation is made of Styrofoam and does not need to be covered. Remove the three screws from across the back and the four screws from under the front lip. Then lift off the top. Sanyo refrigerators have a refrigerant line running across the top and you need to find out where this line is at before cutting through the top. Cutting through this line will release all of the freon and will turn your new Sanyo refrigerator into a curbside masterpiece. You can find this line by plugging the fridge in & letting it run until the sides are warm. Once the sides are warm, rub your hand across the top until you feel a warm strip running from one side to the other. The center of this warm strip is where the line is running across the top of the fridge. Mark the line with a piece of scotch tape. Match the tower diameter with a drinking glass or a can lid. 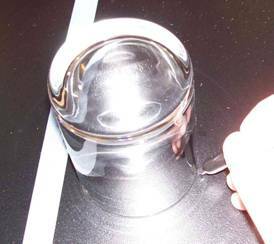 Use the glass and a sharpie marker to mark a circle where you want the tower to sit. Note the tape line that marks the refrigerant line. I'm marking the circle about 1/4" in front of the line. Drill a series of holes inside the circle, making sure that the holes go all the way through to the inside if the fridge. 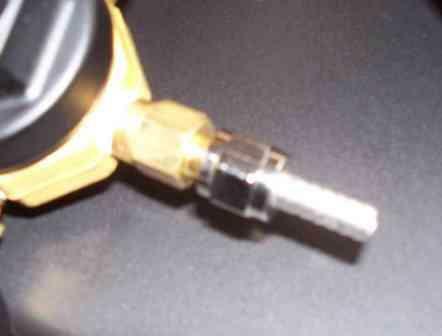 Note: An alternative to drilling a series of holes & cutting with a rotary tool is to use a 3" hole saw. Note again the tape line that marks the refrigerant line. Don't cut or drill there! 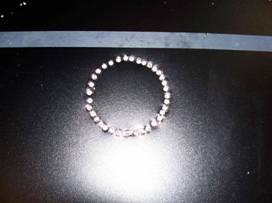 When done, you will have a circle of holes drilled through the top. 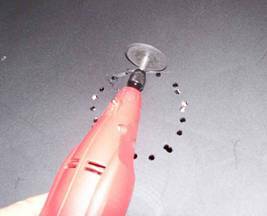 Use a rotary cutting tool or a pair of wire cutters to cut away the metal left between the holes. 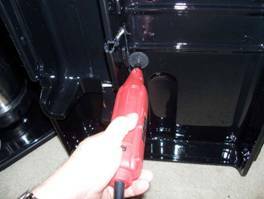 Use a screwdriver to pull out the steel plug you just cut loose. 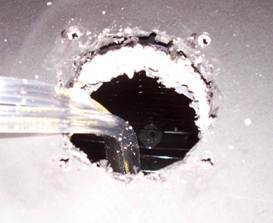 A plug of insulation should pull out with the steel plug. 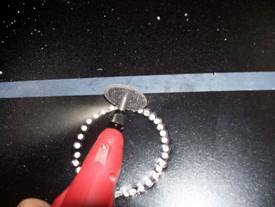 From the inside, use a rotary cutting tool or a pair of wire cutters to cut away the material left between the holes in the plastic liner. When done, pry the piece out with a screwdriver. 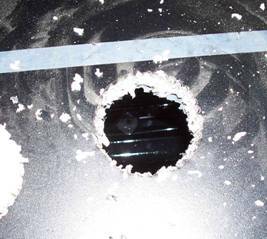 Now, you will have just pit a hole all the way through the top of your brand new Sanyo refrigerator! It looks ugly now but things will start looking better in a hurry. Temporarily put the top back on the kegerator, fastening it with one rear screw and two front screws. 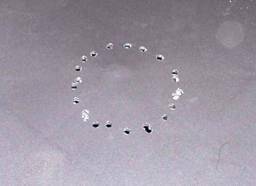 Drill a series of holes through the top from inside the fridge. 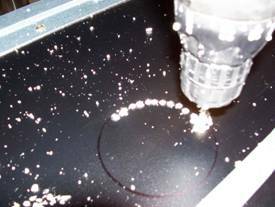 Follow the edge of the newly cut hole when drilling the holes. 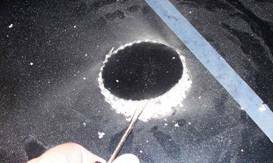 When complete, you will have a circle of holes through the top that outlines the opening you created earlier. 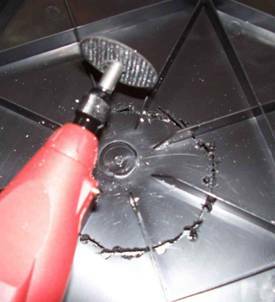 Use a rotary cutting tool or a pair of wire cutters to cut away the material left between the holes in the plastic top. Remove the top from the Sanyo refrigerator and turn it over. Use a rotary cutting tool or a pair of wire cutters to cut away the ribs that are holding the plug in place. Pry out the piece with a screwdriver. 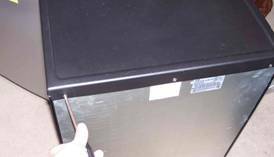 Put the top back on the Sanyo refrigerator and attach it with all 5 screws. Feed the beer tower beer lines through the hole from the outside. Note the white lining inside the tower. Some believe this is packing material and they remove it. The lining is actually important insulation and should not be removed from the beer tower. Center the tower over the hole and rotate it until it the two beer shanks are aligned correctly with the front of the Sanyo Refrigerator. 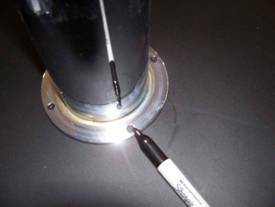 When aligned, mark the four mounting holes with a sharpie marker. 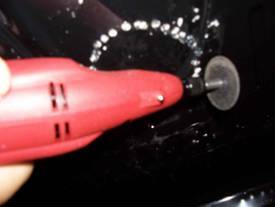 Drill the four mounting holes through the top of the Sanyo refrigerator, making sure you drill all the way through to the inside. Mount the tower with 2 ½” – 3” ½-20 screws, washers, lock washers and nuts. I like to use wing nuts for my conversions. This is the hardware I use to convert a homebrew beer kegerator. 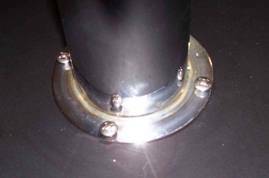 This hardware is not included in my conversion kits because some customers use my kits to convert their bar and beer towers attach to wooden bar tops with wood screws. You can purchase this hardware at any hardware or home improvement store. Note: Some beer towers have a cover that hides the mounting hardware and some do not. The towers without covers will have counter sunk mounting holes. The screw in this picture is a stainless steel Phillips head and it looks good with either tower style. If your beer tower came with beer fittings on the end of the lines, cut them off. 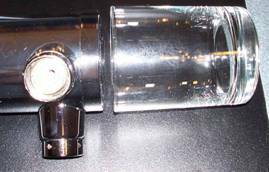 You won’t be able to use beer fittings on Cornelius kegs. Note: Don’t cut any extra length off the beer lines. The long 3/16” ID beer lines will slow down the beer on the way to the beer tower and will help to prevent foaming. 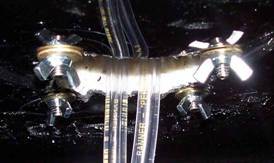 Locate or cut off two short pieces (8” – 12”) of braided CO2 line. 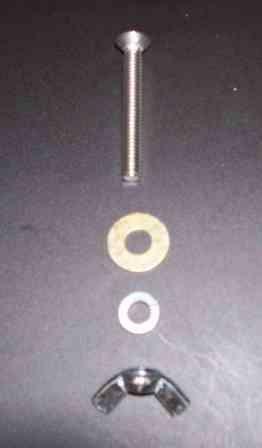 Attach the two short pieces to the stainless steel tee with Oetiker or screw type clamps. 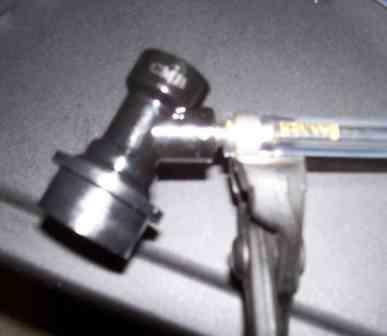 Then attach the long piece of hose the stainless steel tee with a Oetiker or screw type clamp. 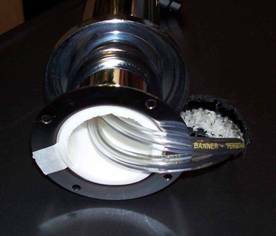 Attach two light grey gas disconnects to the ends of the short lines with Oetiker clamps or screw type clamps. Place the kegs, CO2 tank & regulator back inside the keg & connect the beer & CO2 disconnects onto the Cornelius kegs. Route the free end of the long CO2 line around to the regulator output. Cut the excess off the end of the CO2 line. 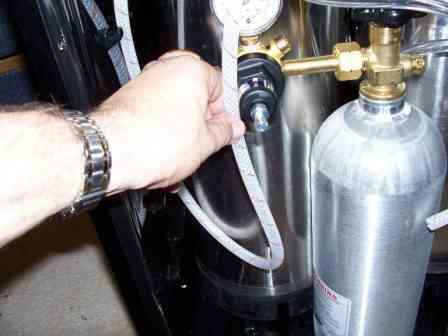 Locate the parts needed to adapt the regulator output to the ¼” CO2 line. 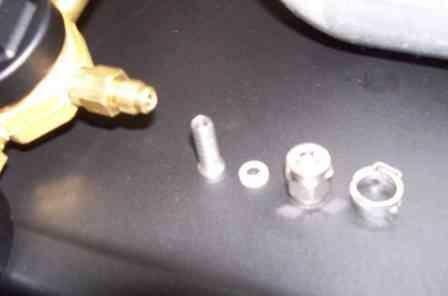 Assemble the parts to the regulator. Note: The barb drops into the nut first, then the tapered nylon washer. Then the entire assembly screws onto the regulator output. 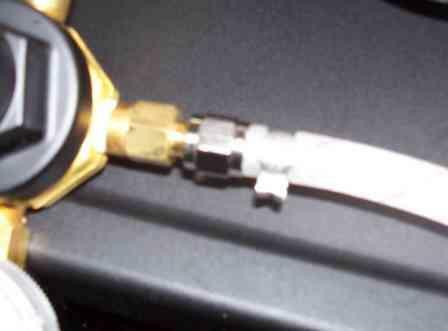 Assemble the CO2 line onto the regulator with a Oetiker clamp or a screw type clamp. When complete, the inside should look like this. Congratulations, you now own a 2 keg homebrew kegerator! And it even looks nice enough to not be banished to the garage! 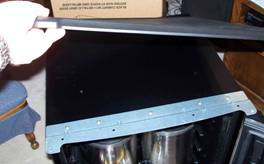 And although not absolutely necessary because the top of the refrigerator is easily cleaned, a stainless steel drip tray is a nice addition to your kegerator. This drip tray is 8 ¼” wide, just wide enough to catch drips from the taps but not so large that it’s terribly expensive.